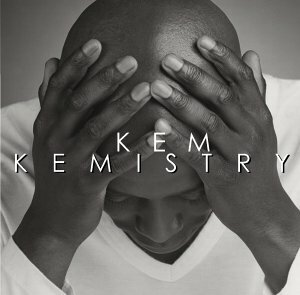 The joy of really good music is that word about it spreads quickly and Kem’s debut release Kemistry is musical proof of that. Several people asked me about and even sent me the website before I had chance to pickup this album. He can be easily compared to Al Jarreau with his sound and vocalization but he brings some fresh qualities to his music. He sings about love, life, faith, hopes, and dreams. He leaves the listener room to embrace the song in our own lives. He is romantic and sensual without being graphic which is definitely a quality reminiscent of years gone by. Born in Nashville and raised in Detroit, Kem is a self-taught musician and his vocal range spans 4 octaves. He began playing piano at an early age at his grandparent’s house. He can mimic many instrumental sounds with his mouth and hands. After much perseverance, he finally quit his job to pursue his dreams of making music full-time. He sold 10,000 albums on his own label which caught the interest of Motown Records. He still sings with his church choir on Sundays. This collection of melodies includes “Matter of Time“, “Say“, “Miss You“, “Love Calls“, “This Place“, “You Are” and “Brotha Man.” His songs are powerful and filled with love and spirit. Kemistry has been at the top of my list for good music to fall asleep by for a few weeks. I am sure it will set the mood for your evenings as well. This entry was posted on Thursday, July 10th, 2003 at 9:30 pm. It is filed under Music Reviews and tagged with Kem, Kemistry. You can follow any responses to this entry through the RSS 2.0 feed. Thanks for reviewing Kemistry! I will pick it up this weekend. Soothing, mellow review, just like the CD….It’s also relaxing driving music…. and other things too *wink*.